Love love love. Knows what I want to see and where before I need to look. Love it. Was painless even a grandma can use it! This is the easiest and best way to purchase movie tickets and food! Great app — great service — great incentives. No brainer! Try it and enjoy. You need an option to add purchased tickets to the calendar. Every other app has this feature. It can't be difficult to implement, this is standard. I like it very much because after buying 4 movie tickets on atom you get one free! This is fantastic! Always easy, and can use the app without difficulty! I also get free movies from T mobile. I highly recommend this app! Rollin in like a movie theater ROCK STAR! No lines... no waiting! VIP all the way! Easy to use, great to invite others, automatically sits groups together even though we paid separately! More expensive than what tickets actually go for. No need to wait in line and hope you find a ticket for the hour that you want to watch the movie. With the app you are able to select when you want to watch it and do it before the movie even comes out which gives you a head start ahead of everyone who goes to the theater to wait in line when the movie comes out. Love the ease of Atom but would really like to see more theaters added to the options list. Right now it is limited where I live and none of the theaters have luxury loungers. Otherwise happy with Atom. Love using the app! Great job. Thank u for the app it makes it easier! I always use this app when buying tickets online. They have a bunch of promo codes out there so I'm always getting discounted tickets. Finding promo codes for fandango is rare. I like that you can get free tickets. I mean who does like free tickets?my advice have your family create individual accounts with one account that invites them all. Our party had one member that couldn’t attend. I called 50 minutes before the showing and stayed on hold for ~10 minutes. Chose to receive a call back with the automated service. Took about 35 minutes before I received a call back, at which point the party had just redeemed the tickets to go into the theater. CS said partial refund not eligible because the tickets were redeemed. Of course they were — it was 5 minutes before the showing. If I wasn’t on hold for over 40 minutes this wouldn’t have been an issue. They granted me an exception to process a partial refund but it was very disheartening to have to fight for it. It sounds like the theater shouldn’t have redeemed all of the tickets, but there’s a clear process gap if they did so even though the party was not in full attendance. When something similar happened with Fandango they acknowledged the burden was created by not being able to speak to CS, so they processed a credit. Atom needs a similar policy - it’s fine to require folks to wait, but when you place the financial burden on customers for that wait it becomes unreasonable. What an awesome app so easy to use. My family and I loved the accessibility. Easiest way to find , invite and pay tickets and food all at your fingertips bypass line to food counter scan grab snacks then live to scan through movie. This app is one of the best to purchase movie tickets. It is clear, prompt, and simple! I love that I can use Apple Pay to buy tickets! Horrible product and customer service! I purchased Prime early access to Hotel Transylvania 3 to surprise my 5 year old son. I just got an email from Atom tickets saying that my ticket had been changed to Deadpool 2, not even a movie I can watch with my son! I immediately called the customer service department to see what was going on. Their response was either cancel the tickets or call the movie theater. The agent told me they had ZERO control of what happens with the tickets and the change came directly from the theater, which I find completely unbelievable. When I asked to speak to a supervisor the agent lied and said there was no one there I could speak to. So I said, “you’re working alone with no one in charge of you?” The agent then changed her story and said they were in a meeting and would call me in half an hour. It has now been 2 hours and no one has called back. I actually called back and now I’ve been on hold for 30 minutes. I am completely disappointed in Amazon for collaborating with such an unorganized and inefficient company. This so called new design is not really intuitive, missing ticket fares that was displayed right next to the show timing and other interesting elements from previous design. This new look feels dumb! This app is so cool and helpful. The invite process is brilliant and easy. I would totally recommend this app. The app has bug and could not work before seeing the movie. After the identifying location, the movie did not show up as any time. I was under the impression we could scan and go with this app. Nope. We still had to return to the concession stand to have our tickets printed. And then it was from a confirmation email, not the app. This was AMC in Auburn, AL. Ironically, before the movie was an advert for atom with the customer scanning the QR code to get into the movie. Once QR scanners are rolled out, this app will get 5*. Also, $3 for a processing fee is a bit steep. It makes 2 tickets to our local theatre $30. Unless we are going to 3D, I won’t use this app to buy tickets. This app is awesome and convenient. Very intuitive. Great user interface. way better than the previous wheel one. Easy, quick, convenient method to order tickets. I’ve changed my mind on a ticket purchase and my money was refunded with no problem. Makes buying tickets so easy! I love that you can watch trailers for movies as well as see movie reviews. It’s Genius! Love how everything is in one place for all my favorite theaters. I called to ask a question and they helped me with everything! They were so nice and extremely helpful! I’m so appreciative of their quality of customer service! Much better than fandango! Easy to buy and easy to cancel if you need to ! It’s a great app but I would love if there were Harkins so I can Enter my Harkins Reward Card. I hope it gets added for all us Arizonans. we always use atom to buy our movie tickets. They’re always giving out discounted tickets, promo codes and they just do it better! Why in the world can’t you order food without buying a ticket? I was sooo excited when i got into the 30 min line at Regal for snacks and drinks when I saw this “atom” pickup line. I was so excited that i was going to be able to skip this craziness and order my food. Wrong...you have to buy tickets first before you can buy food. Seriously disappointed. Why would you limit the ability of ordering? Poor planning and execution. Perfect way to keep up with this new age of watching movies. New Interface is super user friendly. Out of all my purchases through Atom I’ve never had not one complaint nor had to contact customer service about a ticket or money issue. It is SO freaking easy to buy and to CANCEL. You do not know how many times I will buy tickets ahead of time and the group I am with will decide to do something else instead... cancelling with ease. No need to talk to a machine, a human, nothing.. cancel with one button!! Amazing!! Thank you so much Atom. Please look into a monthly subscription service.... where we can go watch any movie as much as we want as long as we’re subscribed!! Sends a receipt for your purchase (thanks, email already handled it) but doesn’t display a useable facsimile of a ticket, so what’s the point? Talk about a huge step backwards. They got rid of the only thing that made them stand out from the other apps. The very cool wheel that quickly showed you current movies, coming soon, specialty events, etc. It was my go to too for seeing whats out at a glance, but now the app looks like every other cookie-cutter app. Also, no sorting and very poor map distance radius for theaters. I want to see more theaters further out. All of these features are in the only real useful movie app; Fandango. I wish that more theatres around me would support this app, it seems super cool! Bring back the old interface design! From a call-for-action interaction design point of view, the old version is so much better than the new one. Great app, easy to use, straight to the point. Great app. Makes ordering tickets super easy, and allows for pre ordering concessions if the theatre supports it. And supports loyalty cards from a number of theatre chains. Loses one star though as every single time I try to order tickets, the first step in the process after selecting the movie location and time is to “invite friends”, and it asks for access to your contacts. If you decline, it will ask again every single time you place another order. In my case, I was checking seating availability at a number of different theaters and showtimes, as it was a new movie and selling out quick. So I checked at least 15 different location/time combinations, and it asked me 15 times to allow access to my contact. I already said no once. Stop asking me every time time! Remember my choice! This app always makes getting movie tickets so convenient. I never have a problem I’m so glad my friend told me about it. I love that I can even order snacks! Very easy to use! I like how easy it is to buy tickets with atom, easier than amc app. I don’t use it every time because they do charge a little bit extra vs directly from the theater but they have a lot of promos which make up for it. I like having it all in one place. Did not send friend’s ticket to their phone. Cancelled the order and bought tickets like a human. Was looking to use this app because I always buy tickets for a group of friends and have them all pay me later and I liked the feature where you can send them all their tickets using FB or their phone numbers. However, I was immediately turned off by the difficulty in navigating the app to find a theater near me with showtimes (that I know are at said theaters) but the app kept saying the closest theaters to me were about 2-3 towns over. I couldn’t find one of the 3 theaters in my city and when that happened I just uninstalled the app. Looks like I’ll stick to the traditional buy tickets on fandango and have my friends Venmo me and give me cash. I was looking for convenience and navigating the app alone was very inconvenient and frustrating. The app works great and makes gifting easy. Easy and simple to use! Super helpful! App is very “no-brained”. Provides your purchase to an online wallet to be scanned by the movie attendant afire your designated movie! I never thought I would be buying movie tickets off an app but it’s so easy and quick that I never stand in line to buy tickets anymore. Best movie ticket app I’ve tried! The invite feature saves from sooo much confusion when inviting friends! Instantly uninstalled even for cheap tickets from T-Mobile Tuesday. I don’t need to give you my number for you to give me tickets. No thanks. Great App for movies tickets! Love the convenience and practicality. Used other apps to buy movie tickets, but this is our fav by far. User friendly and convenient. Very nice app! I’m trying to buy deadpool tickets and the seating map won’t load. Also can’t reach anyone on customer service since all lines are busy. Useless app. I can’t find the theatre that I’d like to go watch the movie at. Not only is the theatre not in the list, but I can’t even search for a specific theatre. Everything is done through current location or by city. This needs to be changed. Never cared to wait in line or look online but this app makes it super easy and gives me all the info I need. Love atom! The features offered by this platform are unlike anything I’ve seen. It’s seamless and fun and in conjunction with Tmobile Tuesday you’ll be getting a lot of $4 tickets !! Only regal and amc theaters, where I live there are much better theaters and I am not at all interested in these options. I log out of my app but I cannot sign back in since the recent update. I’m able to sign in online though. I just it this app over the weekend after winning free movie tickets on the radio, and I've had no issues with it thus far! I cancelled two movie tickets today after my plans changed, and I had no issue rescheduling in the app and getting another set of free tickets! Only quirk is that Cinemark theaters (which I happen to be the closest to) aren't set up with the Atom ticket app, which means I have to go out of my way to look for a AMC. When almost every theater is compatible with this app, THEN it will get a full five stars. However, it's still a good app, perfect for anyone that likes to plan ahead of time and order tickets for movies are coming out soon. The theater closest to me does not use Atom- neither do the Alamo Drafthouse theaters, which are my backup option. It was also difficult to see critic scores/reviews under the movie titles. Great UI for exploring upcoming and current movies though! This is THE ticket buying app. Only place to use em. Star Wars tickets every time their server never crashes, no virtual lines, no 6 and 7 hoops to jump through to get your tickets! No nonsense. With Atom, I’ve never missed out on my favorite movies on opening night. So quick, easy, and to the point. Thanks Atom! Very Easy to use. My favorite movie ticket app! No need for Fandango or MovieTick’s dot com.. I love the ease that comes w/ using Atom, from picking my theater to my seats and payment.. oh, and I especially love the “ADD TO WALLEt” option for my purchases!! Easy to order and look up movies !!! Easiest way to buy tickets! Love this app! Easiest way to buy movie tickets and reserve seats. Easy interface and Contemporary UI. I’m all in for the dark UI, looks amazing on my iPhone X. 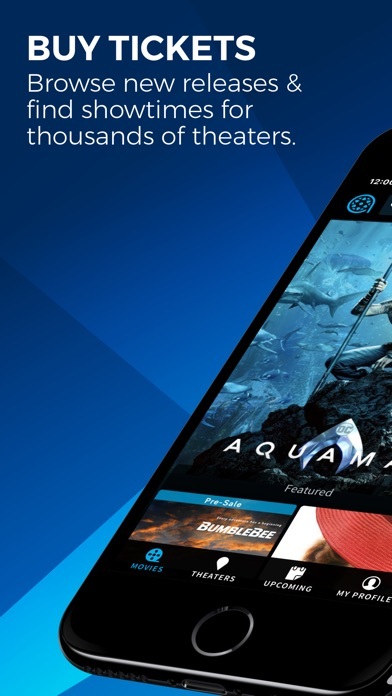 This Application is the best app to reserve movies, better the Flixster and Fandango. 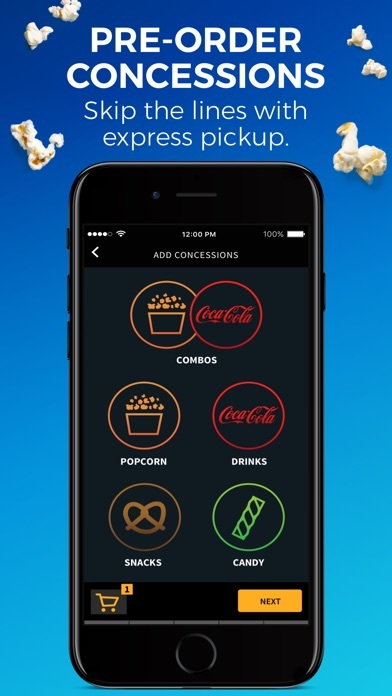 I love going to the movies, and this app makes it so much easier to buy tickets, reserve seating, and get snacks. A must have for any movie goer, really. It was a great app an I have used it plenty of times. It’s made movie watching easier and less stressful and when ordering snacks before hand was available it always worked out great but all of a sudden my app won’t load. I’ve updated it and even closed and tried re-downloading it but it still won’t load. Don’t know what went wrong between updates but it’s fast easy operation has become slow and unresponsive. Great app for couples and friends. Easy to use and inviting people are on group events make it even better. This app is the easiest way to buy, cancel, or change your movie theater seats. It takes some getting used to but once you get the hang of it, it becomes so simple. Don't even think about! Download the app and the rest is history. Thank you for me to uses the atom hope it will be useful to me. A while ago. I had to call the company for A problem taking advantage of at two different T-Mobil rewards Tuesday movie deals. They were awesome. They have me future credits to enjoy movies. Software issues were the problem twice. In addition. Both times, the two different reps called and did a follow up call. That is rare in a company. Fun and social way to purchase movie tickets. The app is very easy to use, supports apple wallet, and reminds me of my upcoming movies based on location. There's always a sweet deal on movies. I just wish they had a sweet feature to look at past movie stubs. I'm a movie stub collector and I miss the ability to collect them. The seating seemed to be mirror imaged in placement. I have a service dog. I try to choose an appropriate space. Last time I used the app, our refreshments were very slowly prepared. I’ve used the app about three times. Hopefully I can raise the rating again. Have ticket; want popcorn; can’t order only food on Adumb; #thisappsucks!! Fandango does offer “free” movie posters and such when you buy a ticket for certain movies, something that Atom has yet to offer, but you have to pay S&H for those “free” stuff. Atom is better. A few cents cheaper than Fandango (Fandango charges a $2 service fee while Atom charges maybe $1.35 or something) and it gives you the option to also add foods and drinks to your order so you can skip the long lines and go to a special line for Atom customers at the theater and quickly pick up your stuff there. Definitely have to download the app and use it during those times. I used to use Fandango as my primary app for movie ticket purchasing but Atom has just replaced Fandango as #1 in my opinion. Thanks! Worst movie going experience ever. My reservation was double booked and the theater (AMC) did not receive my reservation from ATOM even though my App clearly mentions my reservation. Not using it again. Didn’t use the app because it is cell phone only. I have an iPad, ____ you Atom. Project FI phone numbers are out! You cannot use the app with project Fi as the service said it cannot use a VoIP number! Uninstalling this app. Does me no good! It’s so nonsense that they charge $5 more extra from the real theatre price. Great app, but if they want to beat Fandango, they should cut the processing fee in half. Super convenient! And offer good deals from time to time. Very convenient app, and super fast. No confusion, and strait forward. Always has great deals to save money. You're there to reserve tickets. Maybe food. NOTHING more. Stop playing full screen ads. Thinks I am in Hollywood, Can’t change it. Searched my are, one movie available, garbage! 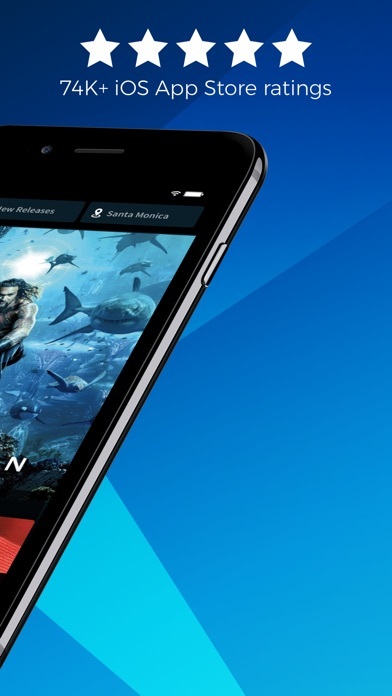 I have been using the Atom app and it has become my first choice for buying movie tickets. LOVE IT! Between the deals and the ease of use this app is the best option for purchasing movie tickets. The two stars is mostly due to the app itself, not the service. Atom as a service is great. Picking a movie and then just showing the QR Code to the ticket person at the theater is easy and convenient. However, the app itself is really slow. It literally took me more than a minute to open the Atom app on my original iPhone 6. It is by far the slowest loading app I use besides Pokemon GO. For a movie ticket service, this is ridiculous. Nobody wants to wait that long to open an app. Fix it and make it faster! I love this app.. they have deals from time to time and I save a lot of money! I don't want to see those ever. I'm not opening your app for that. Decent app otherwise, but 1 star because you force that on me and I can't opt out of that garbage that I never opted in for. User friendly, quick and the social part of it is pretty nice able to invite friends. Downloaded this app for a promotion through T-Mobile just to find out that none of the theaters in my area are supported through this program. Waste of time, waste of data. Byyyyyyyyye. Previous versions of this app worked great, but now it is completely nonfunctional. It’s very intuitive so it’s a very easy to use app. Being able to use Apple Pay and not give yet another company my credit card info is great as well. Now all I see is the loading page and it never changes. I usually don’t go to the movies much but I when I do, used to order through this app but it’s being difficult and not loading for me. I just wish there were more perks. Love this app!! I love seeing movies and this app makes going to the movies even better. It’s so convenient to have my tickets already in hand so I can skip the line when I get there. You can also choose your seats at select theaters which takes the stress out of going to a movie! I’m extremely very happy with Atom Tickets deal/bargains also I can’t wait to see more opportunities/promotions from Atom Tickets and I’ll be seeing tomorrow night at 7:00pm the Movie “The Strangers: Prey At Night” since it was a BOGO very awesome excellent great super fantastic very cool Atom Tickets plus THANK You very much for having Me joined and a part of Your Fanbase! I plan lots of movie afternoons or nights with friends - mostly to see the latest kid movies. This app makes it so easy to share movie times with my friends and have them buy their own tickets next to us. Fun app design, easy cancellation, awesome customer support. No issues. Get this app! I’d like to be able to change time/date of showing without canceling entire order. This app is awesome! Fast, user friendly, modern platform. Love it! Best way to go see a movie, every since I got this app I started going to the theaters more. Had to change the ticket for a different showtime. So easy like 1,2,3 done. Would have given 10stars if choice available. Not working since the update. Locks at opening screen. This app is pretty user friendly to buy movie tickets. I like that every once in a while they have discounts on some movies if you buy 2 or more tickets. My favorite movie app that I have been using for 3 years. It saves all my rewards cards/preferences/payment methods and even allows Hi this is your Postmates driver. I have picked up your food and on my way now ahead concessions and discounts on major movie weekends. Atom is my go to! Latest update broke the app. It just sits on the splash screen forever. Just updated Atom. Opening app just stops at splash screen. That’s it. Will try to delete app reinstall to see if that works. If you want to just scan in and go to the counter with the goods ready for pick up this is your app! (Note -turn on location services your gps thingy it acts as a beacon alerting the concession stand worker you have entered and for them to prep everything for you pretty snazzy ) draw backs atom developers and the corporate side fail to insert conditions for service as in all theaters that participate MUST include allowing the customer the choice to buy the food in advance of entering Regal is the problem some refuse to participate only tickets only and if all things they exclude from the food menu if they do allow it are hotdogs they absolutely refuse to sell the hotdogs via the atom app. This is a regal branding situation sort of there is NO uniform conformity each theater operates independently not good Cinemark refuses to partner with atom and they should! Atom’s app charges less than the Regal app ! I never save my payment information in any app or service for security reasons. This app "conveniently" has an error every time I try to remove my payment information (that I never agreed to save in the first place). Slimy and scummy. For the love of god, stop asking to connect my contacts, please. I have used this app only to buy tickets for the Met Opera Live in HD performances. Simple, intuitive UI, although I was taken aback that nowhere was I asked if I wished to use this or that method of payment on this most recent purchase. Never mind; I am certainly not in the target demographic of this app! Best app ever, with the greatest deals!!! Love this app. I don’t care about the food aspect about it because I’d rather not order ahead on food. It a great way to buy tickets and reserve seats. Especially with the T-Mobile Tuesday app. And if you rage your stubs card to it, fees are waved! The new update is horrific. I’m trying to buy tickets to any movie that’s featured but the only options are Death Wish and A Wrinkle In Time. I can’t buy the $4 tickets for Red Sparrow. Absolute trash. I really enjoy this app, however I only gave it 4 stars because I can’t redeem my free movie tickets through Crown Club Card when my points accumulate to a free movie or for the concessions. I love the prices and ease of use! Easy to use and cheaper than Fandango, it’s my new go to way to get tickets, also uses Apple Pay. Love the new design. Really loving the new update. So much easier to browse by looking through multiple movies at a time. There’s no reason to ever use Fandango ever again, they haven’t innovated in years. What happened to the old interface with the wheel??? It was so amazing and good! It was one of the first things that impressed me about the Atom app. And I used it regularly because of that!! This is so disappointing!!! I hate the new interface where you can’t look at all the movies in a glance. And when you click on the movie, you can’t quickly swipe through to see all the cinemas it’s playing in ... instead you have to scroll through with huge fonts that take up the whole screen. Why ‘fix’ something that’s not broken!!! I always turn off notifications but Atom said they will only send me notifications to alert me about my friend’s response to a movie outing arranged on Atom. Today I got a marketing notification. Turning notification now Off. Only gives me one movie theater and it’s 20-30 mins away. I got there and showed them my confirmation only for them to not find it in their system at all. Since I’ve downloaded this app through T-mobile I’ve been using it it’s very easy to use and also when having issues getting money back for purchasing wrong tickets customer service was so nice . Atom is the Awesome !!!! It used to work better but since last few updates it stopped working, it has trouble connecting to the theater during checkout. I cannot purchase the tickets. Please fix it. Easy, convenient and has never let me down. This App just works!!! I was sent an email by this company saying that I would get five dollars off a ticket if I use their app. Unfortunately this was not the case as I found out when I uploaded the app and tried to use it. Five dollars is not a huge deal but I expect better from a company that is competing against others for my business. I will be deleting the app after this review, And will be unsubscribing from their emails as well. Only one of the seven theaters I've gone to in my area uses the service and none of the theaters I regularly frequent are listed as users of the app. I live near Weatherford Texas. Weatherford has 2 very good theaters and yet the Atom App will not show either theater in Weatherford. The app insists the nearest theaters are in Fort Worth. Atom is worthless to me if I can’t truly see what’s near me. And yes I had it set to see my location and I also tried inputting my zip code with no success. Lots of promotions. Great app. Server was down the whole morning! When it's backed up, the app forced me to pay a $2 convenient fee that we don't need to pay. The overall use experience of the app is very troublesome but we have endured it for the savings for months... They started to charge a "processing fee" last month, which we also didnt complain... But this is outrageous today... Ruined my whole morning before the holidays! Thank you for the great set up offered at JFK, I enjoyed watching part of Home Alone 2 while waiting for my flight! Now, I have ordered my first set of movie tickets through the app, it's so easy to use! I have been using this app for a few years and I am never disappointed! They have the most listings and are better organized than most other apps. The few times I’ve needed a refund issued they do it hassle free! I always like that I can but my ticket in advance and get special offers on top . The major bonus I can cancel upto 30 minutes of showtime if something comes ups. It’s makes feel less stressful cause life happens and I’m able to enjoy the features with little stress as well ! I’m always going to movies these days for inspiration and film/cinema has gotten so much betters ! Don’t Even bother with this app lastnight the whole theaters power went out and they said we will all get refunds no matter how we all paid but I can’t get my money back cause the 30 minutes passes for cancellation? Like I was supposed to know that will happen!? Atom makes it so easy to find a theater, but tickets, and even pay for food and drinks and snacks in advance. This app is very user-friendly, that is understandable to all ages. If you want to look at what’s out there, they’ll have it, and you can even buy tickets on the app itself. By ordering seats in advance, you can ensure you will get a good seat in the theaters. Although they have a pricey convenience fee, you can often minimize that by using the T-mobile Tuesday’s app (if you’re a T-mobile user) and there are deals on $5 off and they wipe out the $1.50 convenience fee that is set on each ticket. I’m so in love with this app already, I got tickets from AMC for $7.74 a ticket without any hassle! Before they would sell “gold” tickets that are $8 each but to be honest, these are just a bit better. You also get to look at upcoming movies and pay for concession meals in advance and that’s a huge advantage of using this app. It’s living up to its hype! If you enjoy movies but dislike long lines at concessions this app is for you. I check in the parking lot to make sure my food is hot and ready as I get in. When in the app you click “rate the app” it asks you if you like the app - if you say “needs improvement” it ignores you and if you say “love it,” it takes you here to leave a review. What a scam... and that explains all the 5 stars for this junk. I’m deleting this annoying app as soon as I buy one ticket with a promo code that was rejected online - after I entered my card, chose seats, etc. Now the seats are already reserved and I’m just waiting on that to time out. If you can do it in the app, you should be able to do it on the website. Why the feature “Invite your friends “ and pay separately is no longer available in the new version, what a disappointment!!! Tried to use my google local guide discount to order movies tickets with atom, but I literally cannot proceed with my order. Upon selecting the seats I wish to reserve, the app slowly says “Reserving seats” with a loading indicator just to say “the seats you’re trying to reserve are no longer available. I’ve tried this several times now and it does it for every combination of seats I select. Then once you go back and look at the seats available in the theater, it has blocked out all the seats I’ve tried to reserve. I love this app. The fact that you can reserve your seats at your fingertips is awesome. But the best thing is when the agent scans your ticket at the entrance, the concession stand workers is alerted (somehow) and starts prepping your online order as you’re walking to the concession stand. You stand in a separate, special line from the general public line which is way quicker. That is so cool. But you can also cancel your tickets too as long as you cancel 30 minutes before the movie start time. Talk about absolute convenience at its best. Awesomeness!!! I like how it has so many offers through the app and especially when you use T-mobil Tuesdays specials. At first it is difficult to understand the works of the app but then wen you find you can do so many things its amazing. I love how you can invite friends and instead of going to each separate movie theater website you can just go to one app pick your( and your friends )seat and decide as a group how it will all be paid honestly i have bought so many tickets since i got this app. Not only that but there is often a separate and shorter line (in many theaters i have gone) to scan your tickets when you buy through atom. The app is very easy to use to order tickets. The app is also compatible with a great amount of movie theaters. DO NOT BUY YOUR TICKETS FROM THIS APP. THEY DO NOT TAKE RESPONSIBILITY. I BOUGHT RESERVED IMAX SEATS AT AMC. I WENT TO THE THEATER AND SOMEONE TOOK OUR SEATS SO WE COULDNT WATCH. AMC MANAGER SAID WE NEED TO CONTACT ATOM TO GET A REFUND BECAUSE WE BOUGHT IT THROUGH THEM AND THEY DONT HAve THE CARD INFO WE PAID WITH. BAD CUSTOMER SERVICE AND A FRAUD. THEY TAKE YOUR MONEY AND DO NOT CARE ABOUT YOU AFTER THEY TAKE IT. WILL NEVER RECOMMEND THIS APP TO ANYONE. I have really enjoyed the convenience of being able to buy tickets in advance and reduce my chances of getting a bad seat and standing in more than one if not any lines. This app is something I would recommend to any movie lover, and after 5 movies you get one free! One sign in and you’re done. Won’t allow access a second time. Doesn’t trigger a reset. Doesn’t allow a different sign in combo. Complete waste of time. Works great and avoid long lines! Super easy, fandango who?? Only way I order now!! Natively support iPad for an extra star. Easy free tickets pay for the use of app! 4th movie is free. Amazing easy to use! Thanks! Every time I try to buy a ticker through the app it signs me out and says my number is already registered. Awful movie experience. Please fix bugs. Love the app, hate that they are getting rid of the free movie!! I use the app every week sometimes 2 times a week and now with them getting rid of that feature not sure if I will continue using it!! Movie made easy! I was able to buy my tickets and food from the concession stand within minutes on the app! I even forgot a drink when I walked in to pick up my popcorn! I didn’t want to stand in line so I used my app and got my drinks within seconds! I will be using my app for all of my movie needs! Thank you so much Atom, for being quick and efficient! You make the choices easy, and give great information on movies and locations. Not able to see multiple booked tickets. Whenever I book multiple tickets I am not able to see all the tickets at once. If that could be rectified this would be a great app. The very first thing the app does upon launching is to show 2 full-screen ads. Then it asks for your location (at least it allows entering a zip code or city name and doesn’t force a GPS access). When you try to buy a ticket, the first thing it does is to ask for Contacts access! What year is this? Why would I upload my entire Contacts database to another company like Facebook for it to be abused? Then to top it all off, I must creat an account with this service to continue. Why? So they can syphon up more personal information from people and sell it, just like Facebook, Google, Amazon and Microsoft do with no regard for any laws, ethics or decorum. Why does Apple allow this garbage into the App Store? Stay away from this trash-pile of an app. I love the discounts I get using the app. This app allows you to buy tickets but doesn’t let you select your seats and you risk being stuck in the worst seats in the house. 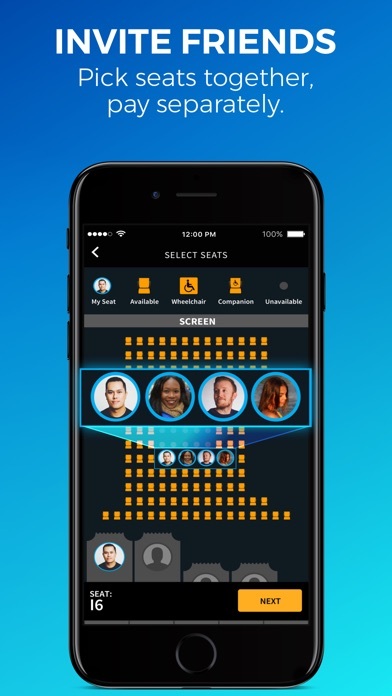 If you want to sit in the front row and stare straight up at a screen, you may not mind this app, but if you want to enjoy yourself at a movie, stick with fandango or another competitor that lets you pick a seat. It would seem that you can only preorder concessions only if you buy the movie ticket through the app. There is no way that I can see to just buy concessions through the app. What a piece of sh$&@ app. Tried to register only to be told that you have to enter a phone number and it has to be with one of the main carriers, not a landline or anything else. And they ONLY deliver your tickets to your phone via text message. Well, I have my txt message feature turned off. Junk app. Don’t use! What’s the point of the iOS wallet integration if the theater can’t scan it? I have to go into the app the have the theater scan it?! What’s the point of adding it to my iOS wallet then?! I'm enjoying inviting my friends to watch movies and save money! Changing the game here. Makes it really convenient to check show times and buy tickets! Made it so simple to go the movies with friends and family 😊 thanks Adam Tickets! There are really no points of contention here. I’ve been using this app for years now and have absolutely nothing to complain about. It’s always worked as expected/intended and quick ticket pickups are a breeze. If you can make an update to where it’s shows the entrance of the theatre. I’ve purchased ticked thinking I was close to the entrance and I wasn’t. Atom is a terrific app. I’m so glad I found it. It’s so simple to use, provides tons of information and makes reserving seats a breeze. I used to have to look at three different calendars to find current releases, special TCM old movie showings, and NT recorded live events. Now I can find dates for all those films and events in one place. And earn points toward free films too! Hooray for Atom! I was trying to book the ticket for aquaman through atom for Amazon Prime special screening and I tried like 5 times and couldn’t book the ticket. This movie show had limited movie seats and filing fast. So I requested for a free movie ticket to Atom. But they refused to provide me a free ticket and my credit card was charged. This is so unfair and rude with their customers. I’m using atom since 2 years and customer executive spoke to me in very rude manner. Highly disappointed and will not be using atom anymore switching to Fandago they have ease of cancelling and refunding tickets to their customers. I will rate -5 for Atom tickets. Easy too use, it’s a breeze! Just a few clicks away and your done! Easy to use movie ordering interface. Movie and showtimes are really easy to find without any confusion. Love this movie app!!!! Having the ability to pay with PayPal is great for me. And the way it works on my phone makes purchasing so easy. A bit more in service fees than other apps, but makes up for it with the free movies. Anytime I try buying tickets it always asks me to enter my phone number after selecting tickets but always says my phone number is already in use, which it is on the account I’m using. It works fine on the laptop but purchasing tickets through the app never works. New to the app here, already love the processes within the app and the ease of booking tickets. The friends option is also a game changer for those who are always indecisive when it comes to going to the movies together. One thing I wish for, and the reason I couldn’t give 5 stars, is the ability to add booked tickets to your calendar app. I always forget what movies I have booked far ahead and depend on my calendar to let me know what’s next. Overall, a great app and great service. Easy way to pick your movie tickets!!! I love Atom, very convenient and a fast process! I like it. It’s fast. I can go in and go out the application after a purchase. Made avoiding lines extremely easy. Some theatres you can even have your concession stand order ready. However some theatres also make you pay a service fee. I found that AMC near me covers the service fee. I’ve been using this app for several months now and it’s hands down my favorite. It’s super easy and convenient to get the seats you want and to also let your friends know where your sitting. They always have deals going on to get discount movies and it makes the experience so much easier. I wish I could give this app negative stars. It NEVER works when you try to redeem your T-Mobile Tuesdays discounted movie ticket. I have to contact customer service every single time and they always take forever to respond. They also pretend like this is unusual. This has been happening to me for over a year. I’ve also seen reviews from other users saying the same thing. This company is a joke. I wish I could get points towards my Regal app so that I could accumulate points. I’m a huge movie fan and this is by far the easiest app to purchase movie tickets. Very convenient app to use, and the customer service is very nice too! If for whatever reason you can’t make it to a certain movie, you can simply cancel up until 30 minutes before the show and you get all of your money back, INCLUDING the convenience fee! If only all movie ticket services were so nice. Nice and easy use, also can cancel the movie ticket anytime before the movie, also no fee charges. I have only used atom for promotional offers but it has worked perfectly, never had any bugs or glitches. Always has the theaters that I usually go to and has a wide range of options such as snacks and inviting friends. Convenient, Easy-to-Use, & Good Deals! I got the Atom Tickets app after seeing a T-Mobile Tuesday’s campaign in which downloading the app would give you a movie ticket for only $5 (I ended up seeing some new release, forgot what it was). I’ve been using it ever since. The app is pretty streamlined so it’s never hard to find movie suggestions, local theaters, or seats. Occasional deals pop up too, like $5 off a movie ticket or other discounts. Highly recommended! I don’t see movies often. I have used Atom App to buy my tickets the last few times and find it easy and user friendly all the way through. A movie ticket discount app that actually works! Atom is great, it partners with other entities like Google Guides and AMC Stubs seamlessly and has yet to crash on me unlike other subscription movie apps. It's easy to use and is often offering new promotions and member rewards. I love how quick and easy it is to buy movies for my fam! Literally 3 clicks and i have tickets, and I love rewards like free tickets!! The App is great for the most part, it has a clean fresh look and is easy to navigate. It is missing some theater support but hopefully more theaters will support it soon. One of the things I don’t like is when watching trailers on the iPhone XS Max is that I’m unable to watch them in full screen or zoom to full screen so the trailer only shows on about half my screen. Once that is fixed and more theaters support it I would give it 5 stars. The app is great and aggregates all movie programs into one place. But good luck referring people. I referred friends and didn’t get credit as they claimed I would. I contacted customer service (which is not in the US) and they blamed me. They then put me on hold for over 25 minutes. I’d use a different app for movies. So far so good...especially for someone who actually hates having apps for regular purposes. It’s very transparent in pricing, fees, availability, and it works seamlessly with my cellular carrier perks and incentives programs/discounts. I’m seeing first screen movies frequently for third run prices. Beautiful app. Works smoothly. Great options but, you lost me at convenience fee. AMC app with $10 a year don’t charge me convenience fee and have $5 movies on Tuesday. Marcus theater app no yearly fee and never convenience fee. Why would I wanna pay convenience fees when I have other choices? This app is quick, efficient & easy to use! I prefer it over the individual theatre specific apps. It shows current movies & those that are coming soon & you can reserve tix for future. Nice app! 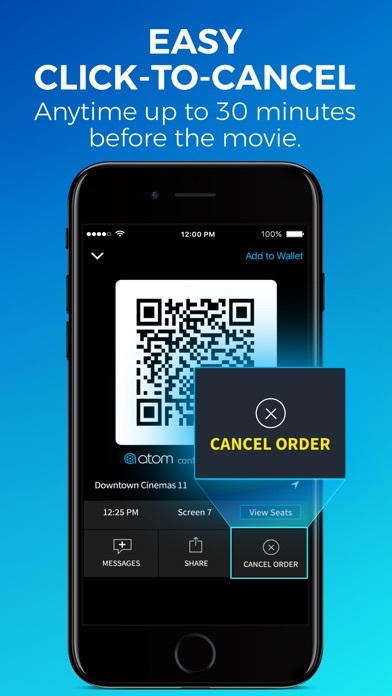 Atom has really changed everything about buying movie tickets. It has the most user friendly interface, makes it so easy to collaborate with a big group, and sends your tickets to your phone. It’s one of those apps that I can’t believe never existed before recently, and I would not want to be without it! I love how convenient it is to use. I used my atom e-gift cards from Costco and I needed to cancel my tickets for a different showtime. After cancelling tickets I was able to use my e-gift cards within seconds for a different movie. This app is so innovative no more standing in line or hoping for available seats. Super convenient for lazy rainy days and people like me 😊. I give this app 5 stars for allowing me to gain an extra 5 lbs of laziness. Can’t wait for the popcorn! I love this app and tell all my friends about it. It’s so easy to use and it does wonders for movie planning with a group. Atom has some awesome incentives as well and great discounts from time to time. I’ve never given any app the credit for changing an experience. Atom does just that! No lines and if something changes after you buy your tickets you have up to 30 minutes before showtime to cancel. It’s kinda perfect. Love this app and the idea of earning free tickets, I just wish there were more participating theaters to choose from. I’m not for movie ticket apps but this is so slick! UI is on point and the rewards are real son!!! A+ perfect score! This is a nice ask in one movie app for movies, tickets, and even concessions. My only problem with the app is that EVERY time you click on the Profile tab to see your rewards, it makes you log in again with your password. That's just ridiculous. At the very least, have the app use Face ID or Touch ID to authenticate, rather than making us type our password every time! $4 fee on every purchase. No reason to use this app. Seating chart was backwards. Stuck in the third row from the front instead of the back. Horrible. Movie prices were incorrect and did not match the theater. No real benefit in using this app. We would have left the movie but no $ back 30 minutes before the movie starts. Buy tickets, concessions and invite friends with ease. Love the app so fast and easy!!!! They give you a 1/2 off for First time users. Love this APP. I love this app!!! I buy tickets for the regal cinema here in town and it does everything including seat selection and buying memorabilia… And combined with Apple Pay, super simple. The first time I used the ticket at the movie theater they had an Atom online receiver and I was in and out no lines, no waiting! I use this app with my T-Mobile Tuesday offers. So convenient, extremely user-friendly, and the value is unbeatable. Highly recommend. I’ve used it twice now and love it! The ease of ordering your ticket is great and ordering the concessions is perfect. You order and then you just pick up. Done all in one app! Easy and nice discount too! Fast and easy! Nice pre order and seat setup! Awesome app with great customer service! So easy to use and fast with Apple Pay!!! I am in love with this app. Love this app. Totally made it easy (and fun) to browse movies, select times, seats and purchase tickets. Great app!!! This a great app... Easy to use, great promos (e.g. Chase Pay BOGO). One suggestion... Please integrate this with the calendar app. (That will be the 5th star that is missing from this review). This is an awesome app. Currently had an issue with a movie, messaged them, and was helped immediately! Great deals honestly! Love this App. Easy to use and has great deals with gift cards and movies. Anything that helps me skip a line is a benefit! Awesome to have for moviegoers!! Awesome. Some theaters have express lines some don’t. It’s the theatre decision to have the lines or not. My theatre do it was hassle free. No wait time. I was able to share the pass with friends I bought the tickets for. They were able to use the pass without any problems. I love this app. This app is a joke. I have tried twice to use it due to being given a promo code for a discount ticket (they smartly offered it to woo faithful fandango users). Both attempts were colossal failures and wastes of time. Payment fails to process or a theater shows as sold out (when it isn’t and I can buy tickets on fandango for the same seating). I deleted the app once, then downloaded and gave it a second chance. I really tried. But fandango gets my money for both being much easier to use AND actually working. Easy to book tickets and GUI is cool. Good lord, I feel like I know who is a suburban soccer mom in the reviews that have been submitted. No hassle! Remembers my cards and loyalty number! Great job! Thanks! It’s a fantastic app that’s very easy to navigate without any hassles. The Best Movie App PERIOD! I can’t thank ATOM enough for their easy-to-use platform to guide me to have a great movie experience! Apparently Atom has decided to add their own fee on top of ticket prices. I can't tell you how disappointing this is to me. I've bragged about this app to numerous people, but now I'm just going to delete it. I don't believe they can justify the app. At least not to me. Peace, Atom! Uninstall. I bought ticket for 3:45. I arrived 10 min late so I can skip the trailer part. Turns out the schedule has changed and my movie does not start until 4:25. I mean the trailer does not start until 4:25. So who knows when the movie can start. I didn’t get any alert, notification or email about the change of time. Very irresponsible app! Since I’m sitting in the empty theater nothing to do, I figure maybe I should trying to write some review. I like the ability to get snacks ordered ahead of time, but my theater has meals that take much longer to prepare and these food options can’t be preordered. That is a big downside to the app. I like buying tix ahead of time. Only problem is that the scanner at the theater doesn't always work. So they have to key in numbers. Takes long when you have several tix. Luv the convenience & simplicity of this app. Well designed! 4 out of 5 theaters near me do not accept Adam. The app is super easy to use. I like that if you want you can use Apple Pay. I like that once you’re done the app text you the movie ticket(s). If you delete the text by accident, you can always go back to the app and pull up the ticket(s). I like that if you can’t make the showtime, they will refund your money hours ... heck... minutes before the movie start with NO problems! Thanks Atom! You can not use this app even you have an account at their website. They seemed determined to collect your personal info such as phone numbers. They claim they only need it to send the ticket. But I just don’t get it, why can’t it be done via the email I used as my account when I registered? Not always easy to find the theater you want. Only gives select theaters near you, not all of them, you have to search for others. Great app to buy tickets. Couldn’t be easier! This app just replaced Flixster on my phone which I’ve been using for YEARS. The only reason I’m giving it 4 Stars is because I wish if a theatre didn’t support atom, that the app would let me pick a movie time / redirect me to purchase the ticket on that theatre’s site. Before you can purchase your ticket, the app asks for your phone number so it can send you your tickets. I’m sorry but I’ve used plenty of other apps for buying all sorts of tickets, and none of them have required me to give my cell phone number. There isn’t even a terms of service note listed, saying that your number won’t be used for anything other than to send your tickets. Full transparency is a must these days, Atom. It’s a “pass” until this requirement is removed. Ordered through the web. Downloaded app using same email. No tickets “orders” in the app. Cool. Just downloaded, STUPID! Nothing but a black border screen with nothing else but a “preview” screen that swipes 4-5 diff xtra screens & nothing else!!!!!!!! STUPID!!!!! Been using Atom for 2 years now to book movies ahead of time in NYC. Very easy to use and ensures you get a great seat almost every time. Love this app! It’s awesome. Better than fandango in every way! Love the perks, super user friendly, great app! I love Atom!!!! Its so easy to order movies,concession items into pre-order my seats!! I absolutely LOVE atom tickets! it’s so awesome and easy to use. Everyone should download it. My wife and I love going to weekend matinees . This app is amazing for that . We can choose our seats , order snacks , and checkout before we leave the house !! All we have to do is show up !! Definitely highly recommend this app . Use it more than fandango. Great for T-Mobile customers as there are deals with that, but also many deals within just the app. Do it and I’m out. They charged my card twice!! I love not having to wait in line for concessions. Awesome. Complete junk. Can’t turn off notifications and their rewards program is a scam—with movie visits instead of movie tickets. Fandango is much better. Convenience in an app.. keeps it simple 2 find & purchase tickets. Best app when it comes to purchasing tickets in advance! I love the promotions. Shout out to Atom for holding it down with the good deals and feee tix! I love this app. I love the chances to win free tickets and the ease of checking in once at the theater. This app is absolutely amazing and it saves a lot of time. I highly recommend this app to all of my friends and family! Looks great already. Much better than anything else out there and excited to see what the next steps are. I was very skeptical when I first downloaded the app but slowly fell in love with it until the day everything changed because of a cancelled movie screening. The theatre refunded my ticket Atom says they did as well but I never got my refund. Thinking about moving to fandango. What if I didn’t have access to technology though? Love the convenience but the concessions seem to need improvement? I often order and when I go pick up food/snacks no one is at the scanner to verify my purchase? Couldn’t this be placed at the registers so there would’ve someone there at all times? Also question why the fee technology is expensive I guess? From 1 star ⭐️ to 5 stars! I gave 1 star for poor customer service but they listened to my feedback and they executed very well. They refused to cancel my ticket and give a free ticket initially. But later when I gave 1 star review they came back to me and gave 2 free tickets. Thanks Atom tickets I appreciate it and would love to continue using the atom app. Special thanks to Brandon for sorting out this issue! Great app. Lots of theater selections. Easy to navigate. I use it all the time. If you use T-Mobile they give out free tickets on Tuesdays. Really? I buy a movie ticket and then can’t send the ticket to my Apple wallet? That’s a real bummer. Fix that and I’d give it 4 stars. Add geo-tracking so that my movie ticket pops up when I go to the theatre and I’d give it 5-stars. Atom has made my movie experience worry free and easy! Great app. Keeps track of all your loyalty cards. Earn free movies for buying through them or referring friends. You can change seats even after tickets are purchased. So far haven’t found the prepay for concessions worth it but this is due to the theater not the app. Great way to see a movie with friends and skip the lines. Adding friends is really cool and cuts out the head ache of trying to text everyone the movie time, seat number, which AMC... You can save your rewards ID and online fee is cheaper than fandango and AMC app (unless you’re an AMC Rewards member it’s Free even in this app). It would be nice if there was not a 1.50$ fee. Charge the cinemas. They get free advertising. Easy to use and likes being able to use it on my phone. I love this app. I have T-Mobile and we get lots of good deals through Atom! I finally get to go to the movies!! Got charged $4.50 for a “convenience fee”. Not gonna do this anymore. My small town theaters don’t have long lines for tickets or concessions... so what am I getting for that additional $4.50 on my ticket purchases? Not a thing. Atom is great in that they show appreciation to their customers with frequent deals and free movies after watching 4. They also work with every main cinema and their loyalty programs which is awesome for scoring with them and the cinema. I use Atom every time I see a movie... you should too ! When I purchase via the Regal app, it seems to automatically be added to my iCloud Calendar. Don’t like that I have to do the extra steps via the email I get from Atom. Easiest and the best way to buy a movie ticket. Apps user experience is better than Fandango or any other movie ticket purchasing apps. Impossible to use with AMC benefits. Very buggy app. Did work for me any of the 3 times I tried. The app is really easy to use. I really like it. But everytime I open the app, I’m always logged out and have to log in back. Is this suppose to happen? I can’t imagine a better app for movie theater tickets. I use it all the time. I cancel when I need to and there’s no hassle. I’ve gotten free tickets for using it often, it’s fabulous. I don't understand why app sometimes charges fees and other times doesn't. The app doesn't explain where it's by ticket count. Also the new iOS ticket picker really stinks, please bring back the old one. What the heck were you thinking? Before it was fast to select 2 adult, 2 child, now it's a pain one by one. I loved the look and feel of the app. Great app. Easy to use. Helpful for groups. Really nice to be able to buy seats together with friends. The only way it could be better if there was access to Cinemark’s theaters. Tried to book a ticket, app offers $5 off, but app won’t book ticket. Not sure why Cobb website prefers this app when it won’t book seats. Called support, answered promptly, but agents do not have the trust of the parent company to offer any kind of remediation or actual support. And I don’t think they are American. They say they will call me which we all know means they hope the problem goes away on its own. I love the accessibility of the app and that the fact it works in conjunction with my A List account! The most convenient way to buy tickets without worrying about them selling out, definitely never deleting. My friends are very disorganized and when it comes to planning anything it gets very chaotic. But ever since I started using Atom I feel way less stressed. Able to connect my regal card so I get points on both platforms. Also allows me to pick A SEAT ANYWHERE! I don’t get blocked! Very poor execution. Can’t print the QR codes. Neither can they be sent to my phone. Really thought this to be a great app. Disappointing! The latest update was meant to “streamline the experience” as the developer said. But the feature to invite friends through the app seems to have been removed, which was very helpful when making plans with friends. Please bring it back! I’m having trouble making a purchase!! Love this app!!! Easy to use and so many benefits. Love the Movie booking experience and rewards! Great job, Atom! Atom help to check my patner and ask him. I didn’t get this pass inspite of trying hard since years what’s happening with all these apps my job was also linked with google account..too bad for those who can do anything insane like this. Awesome app, easy to use, lookout for offers and you will get something or other for new users. Customer service is good and very much reachable. I’d recommend. Switched over from Fandango and I can’t be any happier. Purchasing tickets has been very easy and reliable. I like how they also send a text message of your show time along with the ticket image QR code. Easy to navigate and search. I’m really digging the UI and how everything is organized. Being able to use Apple Pay is really awesome. This is a great app! Love the app, easy to use and easy to get into The theaters! I hate the added processing fees that are added to your tickets! Tickets are expensive enough! I know they have to make money but geez it makes me mad! The main problem with the app, besides it’s clunky, non-user-friendly organization, is that it doesn’t offer tickets at more than a handful of theaters. It also doesn’t provide for senior discounts and special seating for children in wheelchairs. I couldn’t order tickets at the theater I wanted. I have deleted the app and do not recommend it. Very Convenient. I hate waiting in line for the movies. It also makes it easier for me to find out what movies are playing in the movie theater near me.